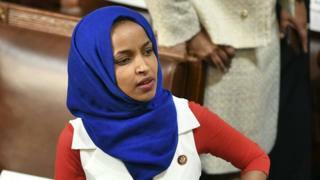 US Congresswoman Ilhan Omar has condemned a poster linking her to the 9/11 attacks displayed at a Republican stall in the West Virginia legislature. She said the "anti-Muslim display likening me to a terrorist" encouraged threats of violence against her. West Virginia Republicans said they did not support hate speech and had told the exhibitor to remove the poster. Ms Omar was elected last November, one of the first two Muslim women to have been elected to the US Congress. The poster at Friday's West Virginia Republican Day in the state legislature in the town of Charleston showed her and the burning twin towers in New York alongside the words: "Never forget - you said. I am the proof - you have forgotten." Who is US Congresswoman Ilhan Omar? In response Ms Omar said the image showed why she was the target of threats. "No wonder I am on the 'hitlist' of a domestic terrorist and 'Assassinate Ilhan Omar' is written on my local gas stations," she said. "Look no further, the GOP's [Republican] anti-Muslim display likening me to a terrorist rocks in state capitols and no one is condemning them." Ms Omar's mention of a hitlist appears to refer to an alleged plot by a self-proclaimed white nationalist. Christopher Paul Hasson had a cache of weapons and a list of targets including Ms Omar and other prominent Democratic politicians. The poster of Ms Omar was next to a poster for ACT for America, West Virginia Public Broadcasting reported. The Southern Poverty Law Center, a rights group, lists ACT for America as "an anti-Muslim hate group". However, ACT said in a statement that it had nothing to do with the poster of Ms Omar and had a "zero-tolerance policy towards discrimination". West Virginia House of Delegates member Anne Lieberman later resigned after she was accused in the House of making an Islamophobic remark. Democratic Delegate Michael Angelucci said that during the row over the poster Anne Lieberman said all Muslims were terrorists. Ms Lieberman declined to comment when contacted by AP news agency. Last month Ms Omar apologised for tweets implying US lawmakers only supported Israel because of lobby money. "Anti-Semitism is real and I am grateful for Jewish allies and colleagues who are educating me on the painful history of anti-Semitic tropes," she said.